Yep, Ignacio is a tiny town. But it has big heart and boasts beautiful views of the La Plata Mountains. It has a population that barely reaches 700 residents,(2000) but has significance as a ranching community. Ignacio, CO also sits next to the 680,000 acre Southern Ute Indian Reservation whose ancestors were among the first ancient inhabitants of the area. The Southern Ute Cultural Center & Museum gives insight into Colorado's Ute tribe. Exhibits "promote positive social cultural and economic interaction and understanding between all people". Ignacio lays claim to the Sky Ute Casino Resort. Ignacio is only about 25 miles from Durango, Colorado and 14 miles from Bayfield, Colorado, the Sky Ute Casino Resort is an ideal home-base to enjoy all the outdoor adventure the Durango area has to offer. And besides, a bit of nightlife and casino gaming action is often a good evening diversion from camping, fishing, snow-skiing and other outdoor recreation. Navajo Lake is near Ignacio and features an abundance of water recreation including boating, jet-skiing and fishing. Lake Capote boasts the top trout-fishing on the reservation. Downtown Ignacio is quaint. It's a laid-back kind of place with a few galleries and casual restaurants. And of course, Mexican food is the popular cuisine. But Ignacio brags of several annual events including the San Ignacio Fiesta held on the last weekend in July. This celebration has been a tradition for over 110 years highlighted with live music, a parade and other festivities. The town is the busiest during the annual Four Corners Motorcycle Rally held around Labor Day. 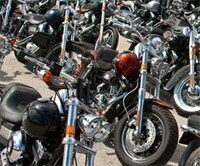 More than 22,000 motorcycles roar into Ignacio bringing bikers to free concerts and hours of daily fun. This mileage chart approximates the driving miles from Ignacio to other city and town destinations as well as points of interest. At an elevation of 6,6860 feet, Ignacio promises four well-defined seasons. Most snowfall occurs from January through March. See the Durango Weather Charts for approximate average monthly temperatures and rainfall. Durango has 6,500 feet of elevation, so Ignacio will be a few degrees cooler than Durango, Colorado. Ignacio has similar year-round weather as Durango. See the Durango Weather Chart for current temperatures and weather forecast in addition to average monthly temperatures and rainfall. Expect snow from January through March.